This event will serve to usher in the 16 days of Activism which is observed from 25th November 2018 – 10th December. The theme of the 2018 Campaign is “End Gender-Based Violence in the World of Work.” This is a time to galvanize action to end violence against women and girls around the world. We hope that the discussion at the High Tea will set the tone for the same by equipping participants with the relevant information on the status, and which areas require emphasis or improvement. This is necessary for effective advocacy on the issue, particularly in light of the spate of media reports of GBV/ IPV incidents, as well as the “Sponsor Phenomenon.” It is hoped that all participants will be well versed to continue with the discussion for the 16days and thereafter, having been sensitized on their role and need to speak out. 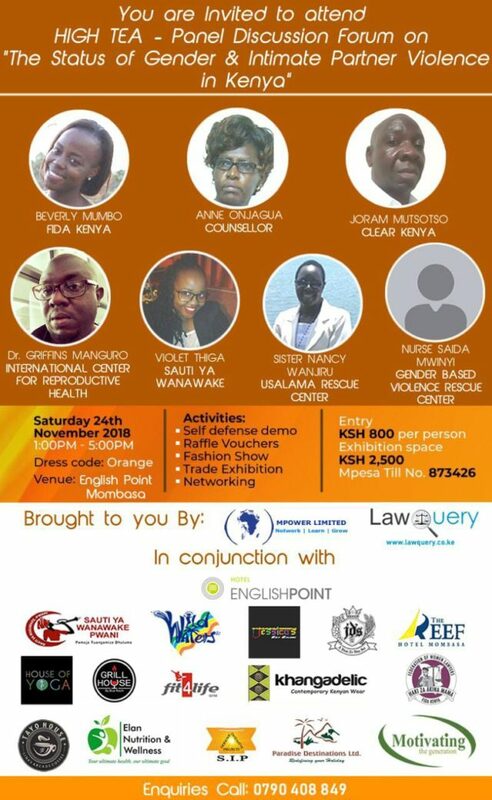 Other than the Panel Discussion, the event will also host – a Self Defence Demonstration, Fashion Show, Trade Expo and Business Networking This High Tea is organized jointly by Lawquery Limited and Mpower Limited. Lawquery Limited is a legal research and consultancy firm. We organize seminars on various legal issues for corporate entities, CBOs and other groupings at agreed rates. We also have monthly scheduled seminars (See calendar of events on our website). You can reach us on 0790408849 or 0722801991 for more enquiries.